The Portage Lakes Disc Golf Association is a newly formed organization recognizing this sport. The Disc Golf course is under development in Portage Lakes Park. When completed the organization will sponsor tournaments, family play, and enjoyment for all who wish to participate. 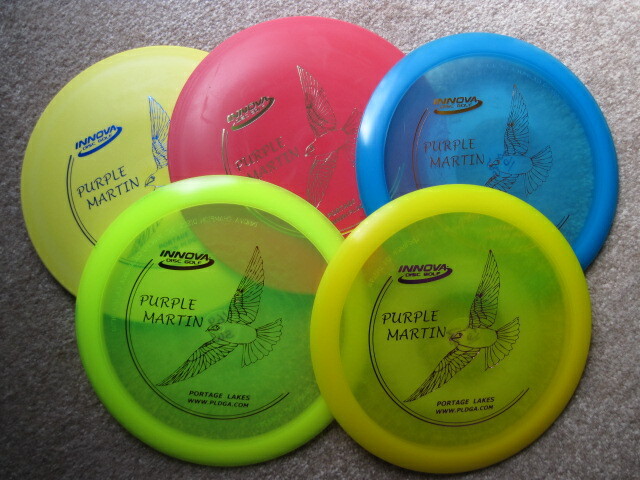 Steve Godar, head of the Disc Golf Association, has kindly made available Purple Martin Discs for those who wish to play the sport with a memento of their favorite avian species. These discs will undoubtedly become prized collector's items. Pictured below, they represent the sidewinder and wedge type disc, $15 and $10 respectively. Jim Frost has a few of these discs now. You may call him at: 330-882-0342 if you would like one. You may also contact Steve Godar, at: 330-644-0544.